A secluded gem within Merida, Casa Lecanda features the most exquisite luxuries afforded by a charming boutique hotel. Offering just seven spacious guest rooms, travelers can immerse themselves within the essence of seclusion during their stay, with architectural elements that are distinct to the Yucatan region surrounding them. Each guest room and suite affords its visitors with plentiful amenities, and guests can enjoy onsite cooking classes or a visit to the Wine & Tequila Bar, comprised of a spirited atmosphere. Just moments away from Casa Lecanda, a variety of attractions await, from archaeological sites spanning centuries, or quaint villages with their own unique charm. Whatever path for exploration visitors may choose, each can indulge their senses and spirits at Casa Lecanda. Casa Lecanda, a member of Historic Hotels Worldwide since 2015, dates back to the 19th Century. 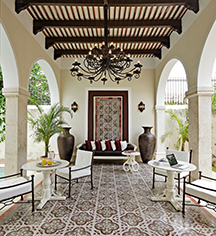 Casa Lecanda, now a bustling boutique hotel, was once a 19th century Colonial residence. 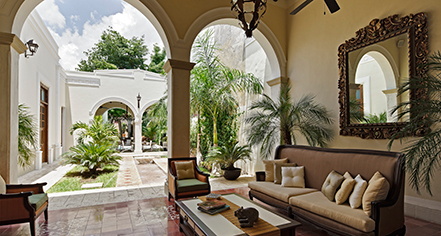 A secluded gem within Merida, Casa Lecanda features the most exquisite luxuries afforded by a charming boutique hotel. Offering just seven spacious guest rooms, travelers can immerse themselves within the essence of seclusion during their stay, with architectural elements that are distinct to the Yucatan region surrounding them. Learn more about the History of Casa Lecanda .